The role of Human Resources (HR) professionals has become more strategic due to a variety of factors, including technology and the globalization of the labor force. As such, today’s HR professional must have a range of skills. The contemporary HR professional must know how to be a strategic partner to top organizational leaders, as well as possess the ability to support a culture of engagement through continuous change. The variety of skills today’s HR professional should possess reflect the complexity of the modern workplace. The design firm IDEO is credited with applying the idea of T-shaped people in the workplace or individuals who are suited for today’s complex environment. 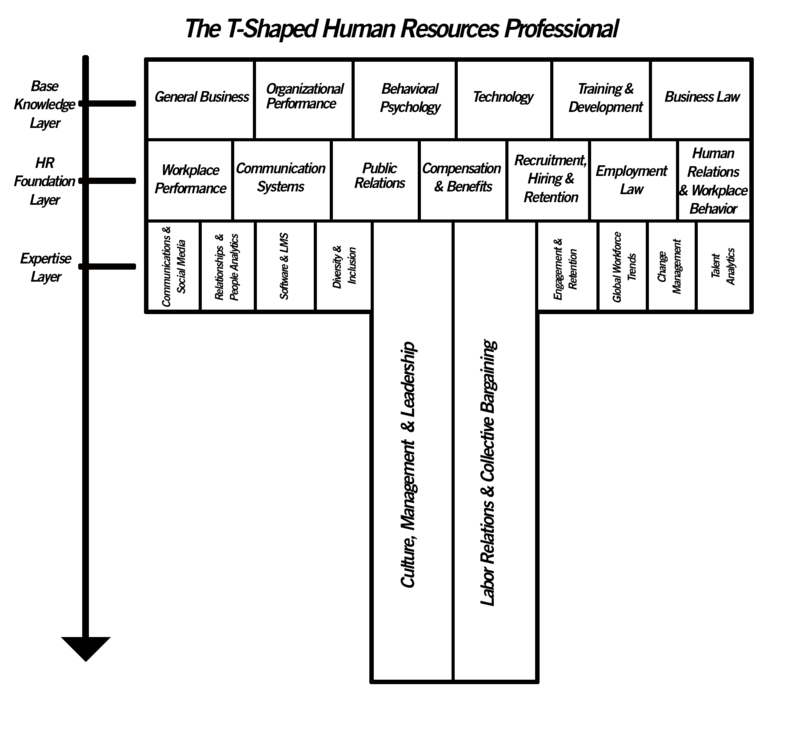 The T-shaped person has a horizontal set of knowledge and skills that enables collaboration across disciplines, indicating breadth. The vertical bars of the “T” represent the depth of specific knowledge and skills important to creativity. The T-shaped concept has been adapted to various professions. For example, in 2014, Brian Balfour developed the T-shaped description for a Customer Acquisition Expert. In 2017, Kevin Lee adapted the T-shaped description to a variety of marketing positions at Buffer. Over time, the various applications of the T-shaped model names general business knowledge and skills, enabling collaboratively working across disciplines, in the top horizontal bar, followed by the relevant skills foundation horizontal layer and finally the vertical expertise bars indicating an organization’s skills priorities for particular positions. Your HR function has never been more challenged than it is today. Your HR professional is focused on responsibilities like recruiting global talent, engaging a diverse and multigenerational workforce and adhering to employment law, to name a few. The T-shaped model for identifying the breadth and depth of the HR professional’s skills assists hiring executives and senior leaders with better understanding the value proposition of investing necessary resources into training HR professionals. It is nearly impossible for a single person to develop expertise in every HR area, although professionals in very small companies must do exactly that. In larger companies, responsibilities are divided among team members. For example, one person may have expertise in employment law and in union proofing, while another may have expertise in HR data collection and analytics. Every business is unique, and that is another value the T-shaped model for HR offers. Kevin Lee at Buffer developed a unique T-shaped model for each position on the marketing team. You can do the same for each position on your HR team, ensuring you have the right mix of expertise. The following is a T-shaped model that can be used to guide the hiring of HR professionals responsible for ensuring an organization adheres to employment laws, administering and monitoring communication practices, and enhancing employee engagement to discourage unions. This horizontal bar consists of the broad business knowledge an HR professional requires to successfully work with leaders. It includes general business knowledge (marketing, finance, production, etc. ), as well as behavioral psychology, technology, training and development, organizational performance, business law, and general communication systems and practices, including negotiation. The knowledge found in this layer informs the skills in the next layers. This is another horizontal bar below the base layer that begins to drill down to the general skills needed to work as an HR professional in any organization. The bar includes skills like workplace performance; organizational communication systems that include technology-based systems like social media; Public Relations to reach employees, families and the press; compensation and benefits; employee hiring, recruitment and retention; employment law; HR specific analytics; and human relations and workplace behavior. These vertical bars contain the specific expertise an HR professional needs to contribute maximum value to a specific organization. These skills can be developed through a variety of channels, such as experiential learning and formal/informal training and development. The potential expertise areas include social media and mobile communication; relationship building; utilizing people analytics for decision-making; collective bargaining and labor relations to keep union free; software applications and LMS (Learning Management System) for training and on-boarding, like Projections’ custom video, web and eLearning solutions for onboarding and ongoing employee communication. There are hundreds of LMS systems available for personalized training delivery that is job specific and offers performance reporting, like the cloud based Litmos and the Cornerstone Learning Suite platform that automates compliance management processes through continuous development. The effectiveness of your HR professional or team ultimately depends on their ability to work in multiple areas. HR professionals responsible for discouraging unions, for instance, should be adept in communication practices, NLRA, labor relations, and employee training and development. Likewise, HR leaders responsible for knowing labor law will also need to have a deep understanding of employee engagement practices. Anyone can quote a law, but keeping your employees informed of things like your company’s perspective on unions can help you avoid charges of unfair labor practices. Regardless of their specific expertise, the ideal HR professional will have a “full stack” of crossover skills that lets the person contribute to a variety of different areas in your business. Finding someone who has the breadth and depth needed for today’s organization is difficult, and especially in a tight labor market in which people with experience are sought after by multiple companies. A good strategy is to identify the people who have the base layer and some of the foundation skills, and invest the time, money, and energy to train superior HR professionals. An important part of the process in developing the T-shaped model for HR is zeroing in on the deeper skills your particular company needs. That drives the investment in targeted development and ensures the HR professional efforts are aligned with organizational goals. For example, it’s important for companies to remain union free, but unions are getting more sophisticated as they adapt to technology and changing work designs. 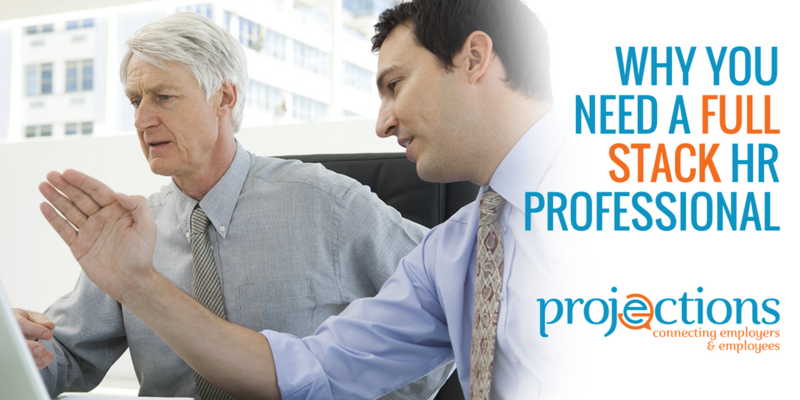 That’s why it’s important to invest in training that leads to UnionProof Certification. Doing so will allow the HR leader to develop an engaging culture that makes unions unnecessary. The deeper skills your organization may need to develop cover a wide range. HR analytics and data-driven decision-making is one area where HR is generally viewed as weak per a number of research studies, and that is potentially holding your company back from meeting productivity goals or from competing in the labor market. Other important skills include things like leadership ability, ability to design and implement strategic human capital programs, recruiting and onboarding, designing effective communication processes for engagement of a dispersed or global workforce, understanding global workforce and business trends, and change management. Deloitte described the need for HR to become skilled business consultants and provided a comprehensive list of deep skills and knowledge the typical HR team needs today. The T-shaped model allows you to drill down to the specific skills your HR team needs. Once these have been identified, the next step is ensuring you make the appropriate investment in training and development. It is an ongoing process that can deliver outstanding results.